A few weeks ago Sasha dropped a comment on my blog about a website called Checkvist. She called it an “online outliner”, a pet project developed by herself and her husband. That sounds pretty cool, I thought. 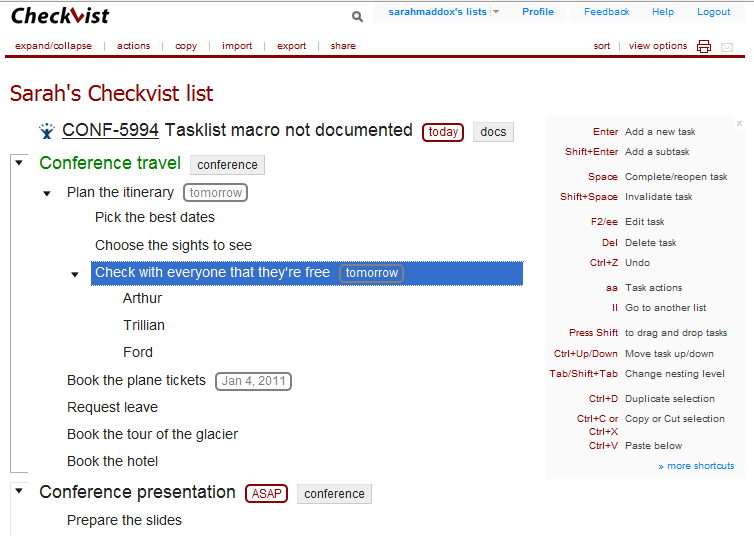 So I moseyed over to Checkvist and found that it’s a place where you can create neat “to do” lists quickly. Then you can do all sorts of things with them. Are you a list person? I am. Never underestimate the power of the list in keeping the scary chaos of the multiplex universe at bay. 😉 Checkvist is particularly awesome because you can create hierarchical lists – one list item can be the child of another. Take that, oh chaotic universiplex! On a side note, people even use Checkvist to plot the outlines of their novels. What does Checkvist look like? The format is nice and clean. You can change the “view options” to display your list as a numbered list or to show details such as date last edited and by whom. I love it! The interface is very no fuss no bother. Just click, something happens, it’s what you wanted and you’re done. The power is in the shortcut keys. Look out chaotic universiplex, here we come. You don’t have to visit the Checkvist website for every interaction with Checkvist. There are a number of options for more flexible interaction. There’s a Google gadget that you can put on your iGoogle home page. I wonder how many people use iGoogle as their home page and how many people use gadgets regularly. Do you? I experimented with iGoogle a while ago, but don’t go there regularly any more. 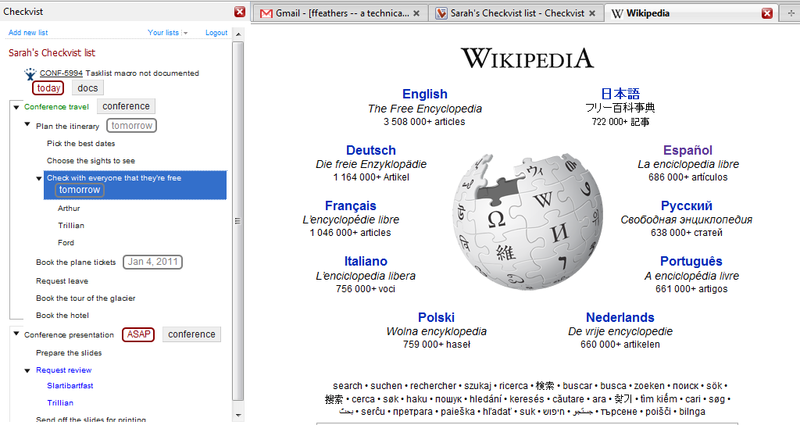 Checkvist supplies a bookmarklet that you can drag onto your browser. First make sure your browser is showing the bookmark toolbar. Then go to your user profile in Checkvist, click “Tools and Extensions” and drag the bookmarklet to the browser’s bookmark toolbar. When you are on a web page and want to remind yourself about something associated with that page, just click the bookmarklet to add a linked item in your Checkvist list. There’s a mobile interface for use on the iPhone and other smart phones. In her comment, Sasha pointed out that you can convert a Checkvist list to Confluence wiki format. True to Checkvist style, it’s very simple. 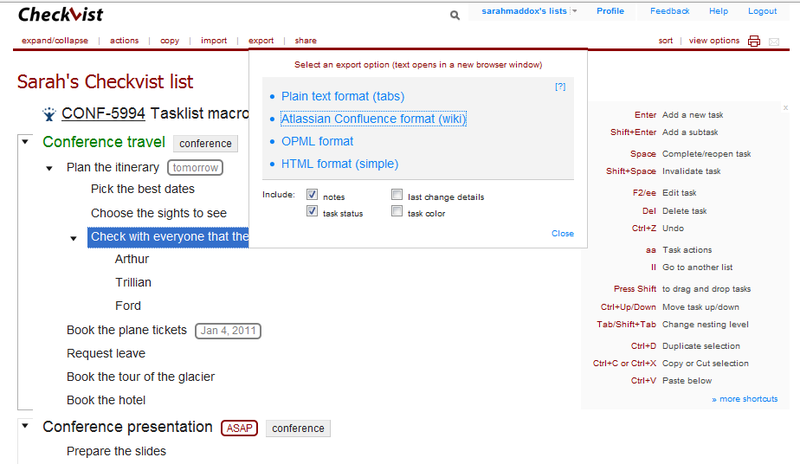 Just click “export” and choose Confluence wiki format. The output appears in a new browser tab, so that you can copy and paste it into Confluence. It contains the wiki markup that Confluence will recognise. There are other export formats too, including OPML. I tried it in the first two. Go to Gmail and open an email message. Click the Checkvist bookmarklet. Checkvist pops up a dialogue offering you the option to add the email message as a task. Why would I want a simple, online “to do” list? I have JIRA for project management and issue tracking. I have Outlook tasks. I have Gmail. I have Confluence wiki for collaboration. Why add Checkvist to the mix? This is the only thing I use Outlook for. It’s a bit of overkill to run Outlook just for micro task management. Sometimes I’m busy with an urgent issue in JIRA bug tracker, and I want to send myself an extra special reminder, just for me. I could just click the bookmarklet to add the issue as a task in Checkvist. Maybe I want to make sure I reply to my mother’s email message, and I’m afraid it will disappear into the morass that is my email inbox. No worries, just click the Checkvist bookmarklet. There’s the guy who outlined his novel on Checkvist. You can share a list and work with other people to compile the tasks – maybe a list of holiday “to dos”. It could be a handy tool for a brainstorming session, especially if the scribe is a wizard with the Checkvist shortcuts. tl;dr: I think Checkvist is pretty cool. Let me know if you’ve tried it too. Posted on 27 December 2010, in bits n bobs and tagged Checkvist, outliner, task management, to do list. Bookmark the permalink. 7 Comments. I like the online collaboration thing. That’s very interesting: seeing a “to do” list as a pattern, that you can share with other people who may want to do the same thing. I can only find 4 patterns on the site at the moment, so I’m guessing ProjectPatterns is fairly new. Cool idea! Sarah, thanks a ton! Such an article is the best Christmas present for us, really. No worries, and thanks to you for pointing me at Checkvist! It will be interesting to see if anyone else has any comments too. LOL, that’s awesome. 🙂 Thanks for the giggle, Sandy.